The steep walls surrounding the Vipava Valley and the gorges cut out by streams and rivers have provided some incredible rock faces that attract climbers from both far and wide. They are drawn to nature’s playground, which offers the ideal routes for both practice and serious ascents. The mild climate even makes it possible to climb on warm faces during the winter, while a shady rock face can be found to beat the summer heat. Once they reach the top climbers are rewarded with stunning views of the majestic Adriatic Sea and towering Alpine peaks. The most beautiful climbing routes in the Vipava Valley face the southwest. 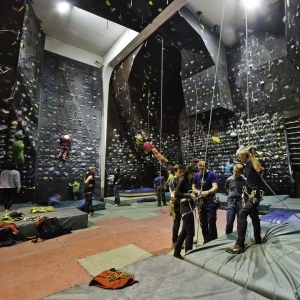 The strong influence of the Mediterranean climate provide great conditions for climbing, while the high number of sunny days has put these walls at the very top of the list for sport climbers. 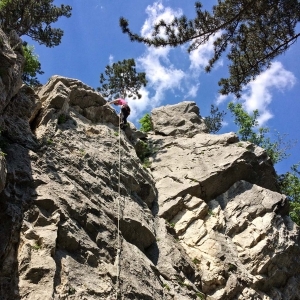 When the weather in the highest mountains goes sour, the Alpine routes in the Vipava Valley provide welcome relief for practicing Alpine style climbers. Climbers will always find a challenge waiting for them in the Vipava Valley. Its popular climbing sites offer almost 400 routes, while climbers can also check out a variety of boulders and artificial walls as well. The most exciting thing is that these forms of climbing are open all year round. Climbers can choose between sunny and shady routes, spend their whole day on the sheer rock faces, or kick back and relax along the relaxing murmur of flowing water. The Vipava Valley is gorgeous all year round. The climbing routes in the Vipava Valley are quite diverse, so the options for cliffhanging enjoyment are simply world-class. Sport climbers are right at home here, as well. Most climbing sites are readily accessible, with parking lots nearby many of them. Climbers looking to stay for several days will also find excellent accommodations.